Over a century old, Rock Island’s Sacred Heart Catholic Church on Fifth Avenue at 28th Street has weathered its years very gracefully. Indeed it takes a very close comparison of this early 1900s postcard with the church today to note any differences at all. We could find only two. The front stairs have been reconfigured and there’s a new building to the rear. The stairway change and the removal of the iron-fenced lawn happened when the city widened Fifth Avenue, bringing the street right up to the church. The building at the rear is the school that was built in 1923 and which was later used as the junior high for Jordan Catholic Grade School system. 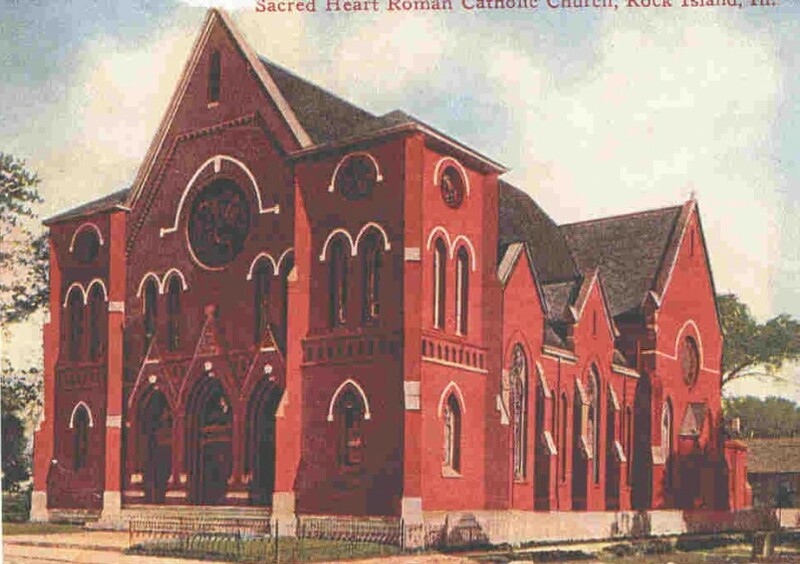 For many years there were only two Catholic churches in Rock Island, one for those who spoke German (St. Mary’s) and another for the English speakers (St. Joseph’s). But as Rock Island grew towards Moline in the 1890s, with many newcomers of Irish Catholic descent, another English speaking church was needed. Rev. Joseph Lockney organized the new congregation called Sacred Heart in 1898. A small frame church was immediately built on the site of the present church, and an adjacent house was purchased as well. When it came time to build the new $40,000 church in 1901, that house was moved slightly east, where it still serves as the rectory. The new church was designed by local architect George Stauduhar, a prominent designer of churches throughout the midwest, and the contractor was John Konosky. The cornerstone laying, in May 1901, was an ecumenical event, with representatives of many local churches present. Bishop O’Reilly of Peoria presided over the celebration, which included the Augustana College brass band playing “sacred and patriotic” music. Only a year later the church was dedicated. In many ways, the church is typical of Mr. Stauduhar’s style, which is often termed “eclectic,” meaning that he combines a variety of elements into a single building. The steeply pitched roof, pointed arched openings at windows and doors, the round “rose” windows, as well as the rudimentary flying buttresses are all elements of the Gothic style. But a Gothic church would almost certainly have a tall steeple. It had been speculated that the Stauduhar design called for twin steeples but that the congregation ran out of money before they could be built. However pastor Rev. Ambrose Cunningham told us that he had obtained a copy of the original architectural drawings, now in the University of Illinois archives, and found the corner towers were designed just as they appear today. These shorter towers are reminiscent of Romanesque style churches, which often had similar bell towers beneath shallow pitched roofs. At Sacred Heart, however, no designs ever encompassed a belfry. The many stained glass windows are believed to be original. Transoms above the three main entry doors have unusual “paisley” shaped jeweled windows incorporated into their relief molding. On the inside, the historic architecture and furnishings are intact. Even the original Henners pipe organ is regularly maintained and used. The rectory, one of the oldest houses in Rock Island, is as interesting as the church. It dates from about 1850 – remember, this area was part of the pioneer village of Farnhamsburg – and is very similar to an 1849 home on First Avenue and 12th Street that was razed in 1960. An 1857 map shows several large homes on Moline Avenue as Fifth Avenue was called then. Rock Island County Historical Society has a June 28, 1954, interview with Miss Cora Whitman, who said that the rectory was built by Ben Harper and then sold to Charles Buford in 1853. Later Miss Whitman’s father, William Whitman purchased it and she was born there in 1863. He was one of the Chicago businessmen who built the first railroad bridge across the Mississippi. It was later occupied by the Milo Lee family and his daughter, Rhoda, who marred Fred Denkmann, Jr., was married from here in 1884. Miss Whitman also said that the kitchen was separate from house, commonly known as a summer kitchen. She also noted that the house had been moved when the church was built. The rectory is in the Greek Revival style, popular from 1820 to 1860, although it shares similarities with earlier 18th Century styles, including Georgian and Adam. The windowpanes surrounding the front door are characteristic of the style. Four chimneys are built into the end walls and the third story windows are covered by ornate grillwork. Sanborn maps show that the porch was enlarged to its present size after 1906. Over the years, additions and modifications to the Sacred Heart buildings have been made to keep up with new needs. It is clear that changes have been done so well that they have not detracted from the historic quality of this church. For that continuing commitment to preservation we thank its pastors and its congregation. This article by Diane Oestreich is slightly modified from the original, which appeared in the Rock Island Argus and Moline Dispatch on January 19, 2003.